Selena Gomez revealed that she underwent a secret kidney transplant this summer. The "Fetish" hitmaker took to Instagram on Thursday morning to break the news to her fans who "had noticed I was laying low for part of the summer and questioning why I wasn't promoting my new music." It turns out, Gomez needed a kidney transplant due to complications from her struggle with Lupus. "It was what I needed to do for my overall health," she explained. The 25-year-old shared that it was her actress friend, Francia Raisa, who donated her kidney to Gomez. "There aren't words to describe how I can possibly thank my beautiful friend Francia Raisa," she wrote. "She gave me the ultimate gift and sacrifice by donating her kidney to me. I am incredibly blessed." Before her unexpected surgery, Gomez has been gearing up for another album cycle by releasing two singles earlier this year: "Bad Liar" and "Fetish," featuring Gucci Mane. Both singles had accompanying music videos, but Gomez notably didn't do much extended promotion for either song. "I honestly look forward to sharing with you, soon my journey through these past several months as I have always wanted to do with you," she continued to explain. "Until then I want to publicly thank my family and incredible team of doctors for everything they have done for me prior to and post-surgery." 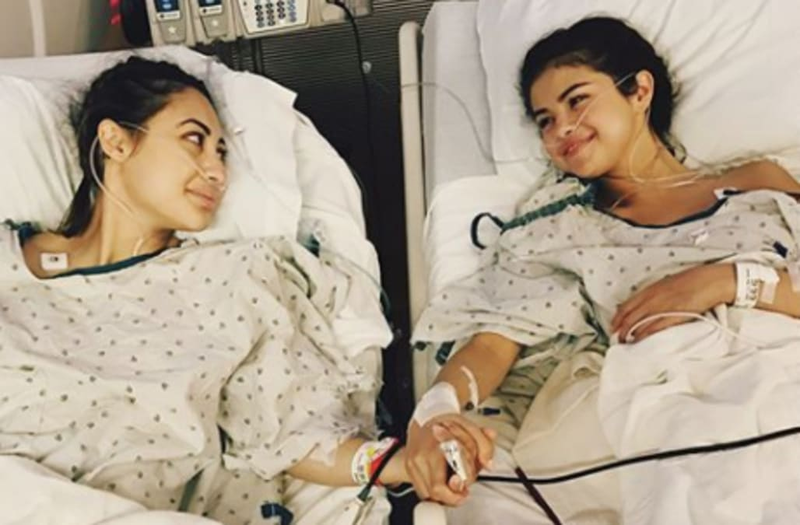 Below photos of her and Raisa holding hands in adjoining hospital beds, as well as photos of their large transplant scars, Gomez also used the opportunity to encourage her fans to find out more about Lupus. "Lupus continues to be very misunderstood but progress is being made," she said. "For more information regarding Lupus please go to the Lupus Research Alliance website: www.lupusresearch.org/ -by grace through faith."